Big Bamboo, is a short stroll (2 blocks) to the pristine “emerald beach” with white-sugar sand, Caribbean blue water and spectacular sunsets. 1st Floor: A lovely covered porch extends the length of the house. The living area has 40″ tv, dvd, sleeper sofa. Dining area seats 8. Kitchen has island bar with additional seating for 3, plus all stainless appliances. Half bath. Queen bedroom 20″ tv, dvd & full bath. 2nd Floor: Bedroom with set of twin bunks, tv, dvd, patio & bath. Queen bedroom shares a hallway bath with the bunk room. Laundry closet. King master bedroom, 40″ tv, dvd, bath with double vanities, jacuzzi tub & shared patio with the bunk room..
3rd Floor: Loft with day bed/trundle pullout, 20″ tv, dvd & cosey patio with a view and seating for 4 around a table. Carriage house: Has a living area with sleeper sofa, 20″ tv, dvd & patio. Small kitchen area with all appliances (no oven). Queen bedroom with a full bath. Experience an outstanding vacation in this unforgettable beach home located in this sought after community. Take a relaxing stroll along palm lined pathways to the enormous 12,000 sq. ft. swimming pool with fountains, waterfalls and two bath houses. Meander through this delightful community to the sugar white beach approximately 400 yards away or you can call for the shuttle service to give you a ride to the access. 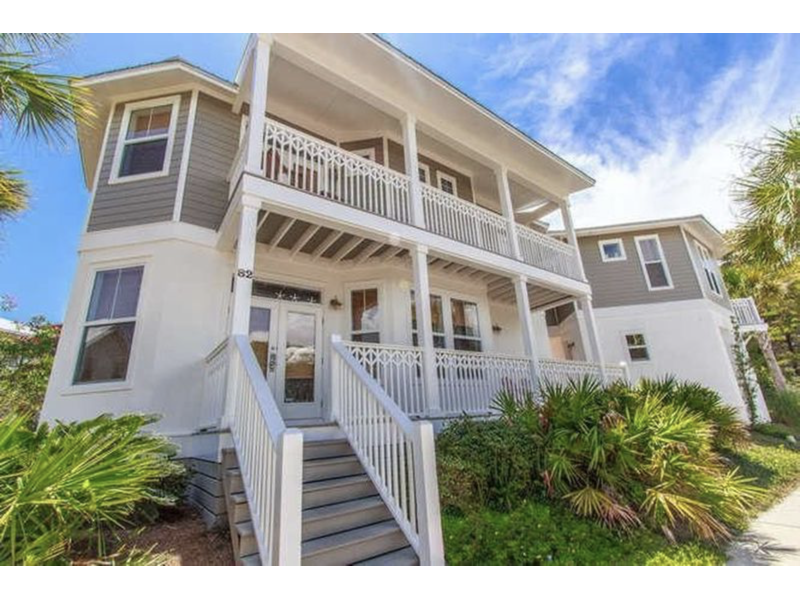 Located in the Seacrest Community directly between Rosemary and Alys Beach. Within walking distance to shopping, dining and almost any activity your heart desires. House has outside shower, gas grill, and can park up to 5 cars. Information deemed reliable but guaranteed.